Today we’re featuring Borzoi, our luxury sock weight yarn. 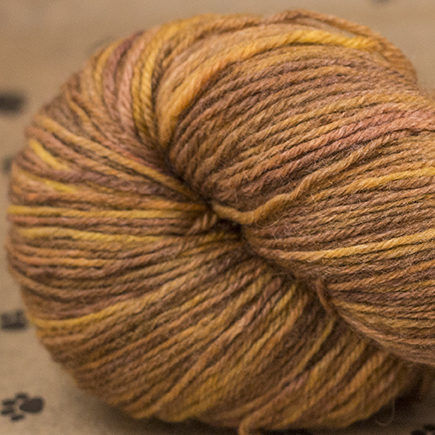 This yarn is 80% Superwash Bluefaced Leicester (BFL) wool, and 20% Bamboo. Although there is a relatively small amount of bamboo in the yarn, the yarn has a specific sheen and color because of it. Bamboo is often used as an eco-friendly substitute for silk as they are both straight, shiny, and strong fibers. Paired with the shiny BFL, the yarn has a very soft and silky feel. When dyed, the colors do not absorb as thoroughly as they would in other fiber combinations, since the bamboo is a plant fiber, and the dyes we use are meant for animal fibers. This creates a beautiful, vintage look for the yarn. The yarn is a round 4 ply, which gives it great stitch definition for cable work and textures, as well as being sturdy enough to withstand the abuse of most feet. Borzoi is great for more-special projects that you’ll cherish for years, as well as being strong enough for harder wearing clothes, like baby sweaters or socks. Click here to check out Borzoi in our online shop! Don't see the colorway or amount you want to buy? Custom order it and let us know! Posted on June 18, 2014 by Caitlyn Faust and filed under Products and tagged Borzoi.